After a day dedicated to bees last week, this weekend it was time for the butterflies to entice me into the sunshine. It started when I noticed a painted lady fluttering around the bottom of the garden. These migrants are certainly some of the most flamboyant of butterflies – as beautiful on the underside as the upper side of their wings. They were enjoying the buddleia which they were sharing with several red admirals a couple of peacocks and a small tortoiseshell. 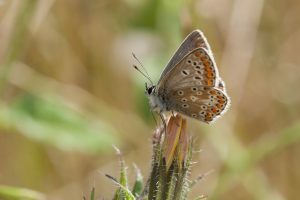 So after a quick detour via the front garden where a small skipper was enjoying the verbena bonariensis I went for a wander to a field that I’d seen my first brown argus in last year. In fact it was apparently the first time in many years that it had been recorded in Daventry. The field is much more overgrown than last year with fewer plants, but it was alive with the sound of grasshoppers and crickets. 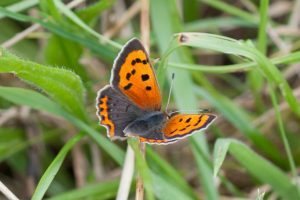 I only walked a short way in when I saw arguably one of our most beautiful butterfly, the small copper. I have only ever seen it in this field and at the country park in Daventry. It may be small, but it is dazzling. My pictures today really don’t do it justice, but it was constantly hiding behind grasses when it had its wings open. 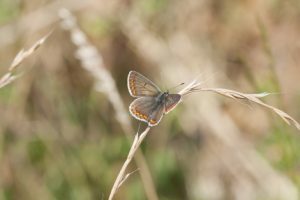 I wasn’t really expecting to see a brown argus again, but luck was on my side and I got really good views. 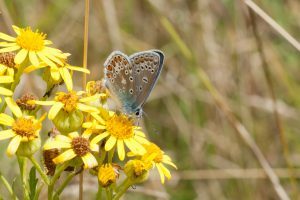 It is an inconspicuous looking butterfly, and often confused with a female common blue, but the brown spots on its forewing and the lack of blue even near the body convinced me I had found my quarry. 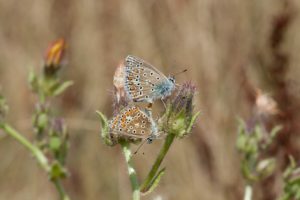 Speaking of common blues – there were quite a few of them about – some of them having a bit of a quarrel and some not. The males are a beautiful blue whereas the females have varying amounts of blue on them, all the way through to almost completely brown. Sadly all of these butterflies were in a field that they are planning to put old people housing on. 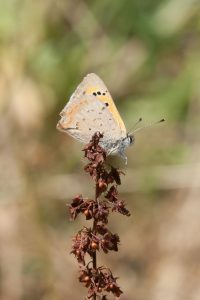 So, this could be the last time I see brown argus and small coppers in Daventry.